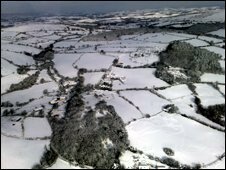 A mother has given birth to twins in Devon after firefighters battled through a blizzard to reach her. When Andrea Dunn went into labour just before midnight, the snow was too heavy for ambulances, and an RAF helicopter was unable to take off. The local fire crew finally came to the 34-year-old's rescue after fitting snow chains to their appliance. Mrs Dunn, from North Tawton, gave birth to healthy twin girls at Okehampton Community Hospital at about 0700 GMT. The seven-mile trip took 40 minutes as the eight firefighters had to stop twice to clear fallen trees and debris from the road. Four more firefighters and Mrs Dunn's husband followed in a smaller, 4x4 fire truck and also helped to unblock the road. Mrs Dunn said she and her husband, Will, were extremely grateful for the efforts of everyone involved in the delivery of their daughters, Elizabeth and Stephanie. She said: "I just want to say thank you to the NHS and the emergency services for all they have done to help and for making sure that my babies arrived safely." Crew manager Twiggy Lake said they received a call from the family and the woman was having contraction every 20 minutes at about 2330 GMT. "It wasn't possible for an ambulance to get through and they were going to send a helicopter but the weather closed in and it could not take off. "We put snow chains on the engine and took four extra crew in a 4x4 in case we needed help on the way. "The snow is the worst I have seen since 1977 and was two feet deep or more in places. "We knew we had to keep going if we could because if you stopped in that snow it was very hard to get moving again. "It was getting worse and we spent the night at the hospital and only made it back by driving behind a snow plough." A spokesman for Okehampton Hospital said: "The lady arrived with the help of the fire service and gave birth to twins. "She and the babies were moved to North Devon Hospital as a precaution by air ambulance in the morning and they are all doing well."